IT would be so cool to earn an money with your twitter account don't you think like that . So today i have brought to you which every one likes the most in the World money without any problem. ya its true so i think i should tell you what it is. 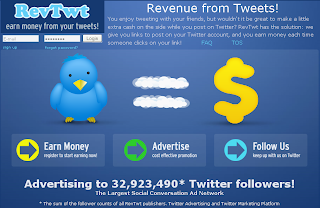 RevTwt is an site which will pay you just for your tweets isn't it cool ? Get ready to get some Extra earning. To start with RevTwt , you need a Twitter account and RevTwt account. You need at least 50 followers on Twitter to start the service.Just follow people and they will follow you back as a courtesy or check my earlier post on How to increase twitter followers ! How to earn from RevTwt ? Referrals you just tweet out the url,Ad clicks you get to chose companies that pay so much per click.This is my referral link : RevTwt There is a minimum of $ 20 to request the payment and you can receive the money through your PayPal account.